How to Use Oxiclean. OxiClean is a dynamic cleaner that can be used to remove stains from various household items. OxiClean comes in a concentrate or liquid form and not only acts as an independent stain remover, but also boosts the effectiveness of your regular laundry detergent when placed in a wash cycle. OxiClean can be used in the following ways. Put OxiClean into every load of laundry. 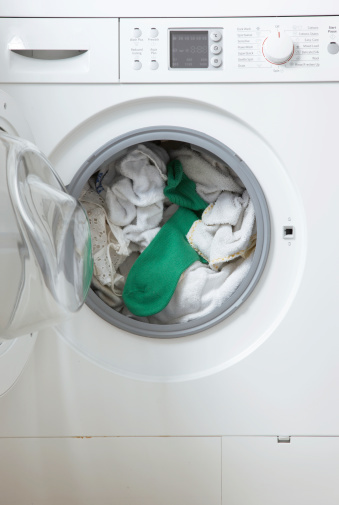 The size of the load will determine how much of the stain remover you use. Add OxiClean and then detergent into the washing machine. Use OxiClean to pre-treat stains. If you have hard-to-remove stains on your clothes, use OxiClean to get rid of them. Dilute the OxiClean with water and then place the mixture directly on the stain. Let it sit for 10 minutes before you place the item in the wash. Wipe down hard surfaces with OxiClean. Linoleum and shiny surfaces can be cleaned with OxiClean. Rinse the mixture away after wiping the area with a sponge that contains the solution.